It’s Been a Success! 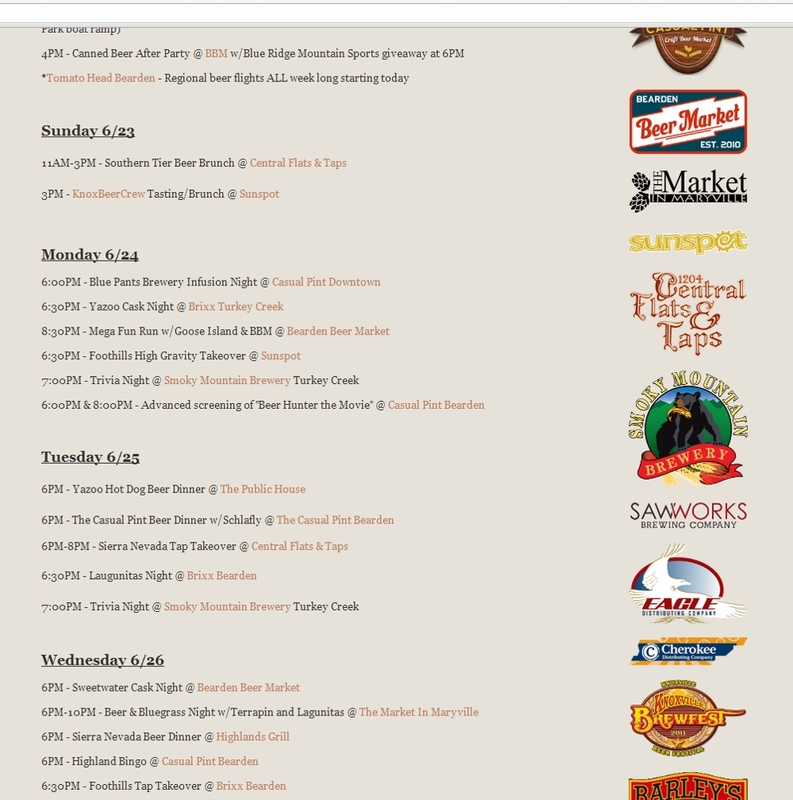 Knoxville Craft Beer Week, only 2 days left. Every day of this week has been a beer version of choose your own adventure. With so many great events each night, and only 1 of me, it was hard to pick what to attend. I started off #KCBW in what I consider “My neighborhood”, Downtown. Both Suttree’s and The Casual Pint had special cask to kick things off. The Casual Pint took it 1 step further and had Union Avenue closed down for a block party featuring bands playing and vittles from the Hoof Food truck. I visited Suttree’s first where I enjoyed a beer with a few friends before heading over to The Casual Pint. I didn’t stay out for very long. I actually went to bed super early so I could get up super early the next day. Sunday was brewday. I was up at 4:30 to prepare. The plan was to brew a batch of wheat beer and be completely finished with clean up and everything in time for the Knox Beer Crew meeting at Sunspot. Thanks to help from my good friends and assistant brewers, Todd and Richard, we did just that. My buddy Dalton, who has been missing in action showed up and lent a hand for awhile. Friends Joy and Willie stopped by to lend support as well. We finished brewing in record time, and I was able to take a short 45 minute nap before heading out to Sunspot for our monthly tasting. The Knox Beer Crew Monthly tasting was an official Knoxville Craft Beer Week event, so we wanted to make sure it was done right. The usual suspects we there and we did it up bigtime. We met on the upstairs patio of Sunspot’s new location. A couple of us brought pop-up canopies to shade us from the hot summer sun. At this tasting we also did a swap meet, where some of us brought shirts, stickers, bottles and glassware to trade. I got a few things I have been wanting to try for awhile. I also got a couple of rarities. We had a few new members join us, and we had a great time. Everyone brought their A game to this tasting, by busting our rarities from the cellar and hard to find beers from all over. My buddy Jason Smith had just returned from a beercation in Vermont and brought my favorite DIPA, Heady Topper to share. Richard Groves brought a bottle of Rogue’s Voodoo Donut Chocolate Banana Peanut butter beer. I can’t even stand the smell of the last beer in this series, the Maple Bacon beer. The new one was only slightly better, but many people passed and those who did only took a tiny sip. There ended up being a 3/4th full bottle sitting there, getting warm. The next thing I know, I was being dared to chug it for a can of Heady Topper. I love Heady, but that was too much. I negotiated for 2 cans of Heady in exchange for this stunt. Jason Smith agreed, and the next thing I know I’m holding my breath and downing this nasty concoction straight from the big pink bottle. I did it and here are the videos proving it. Thanks to Matt Crowell and Animal for providing these. The tasting ended and I packed up and got some water to go and hit the nearby greenway to walk a few miles, sweat and sober up before I drove home. My Favorite Double IPA, Heady Topper from Vermont. Super rare. Monday was something we all looked forward to. 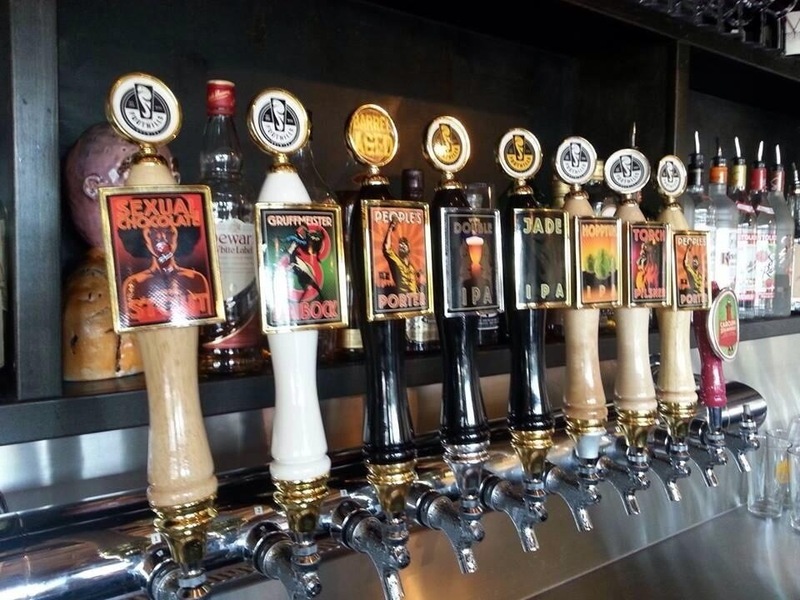 The much sought after Foothills Sexual Chocolate and several other rare Foothills high gravity beers made their debut at Sunspot. 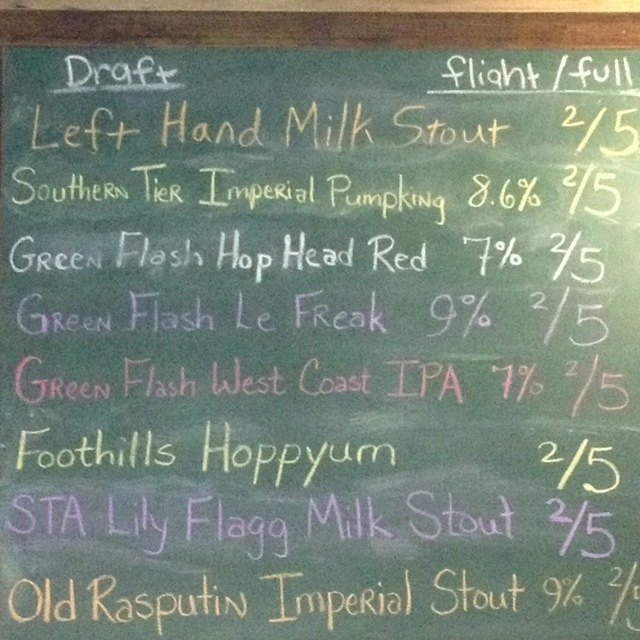 Foothills High Gravity Tap Takeover at Sunspot. The local distributer had to move heaven and earth for the permits to go through in time to make this event happen. I headed there after work and met with more of the Knox Beer Crew. 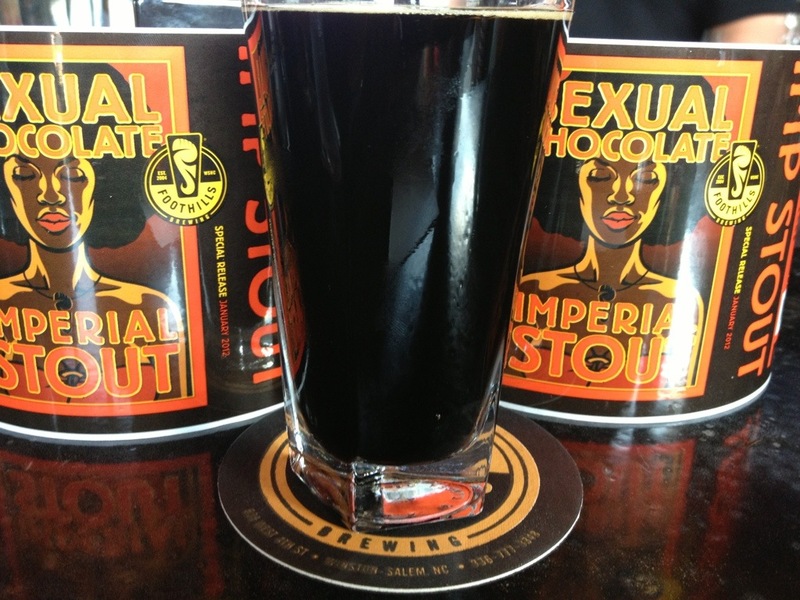 I love Sexual Chocolate and have had many opportunities to drink it. That is why my 1st beer was the Gruffmeister Maibock. While I was hanging out with my friends, I got a call from Cara at The Casual Pint. They were having an infusion night at the downtown location, and were having a hard time getting everything set up. They needed my help. I finished my beer, said my goodbyes and headed downtown. Sexual Chocolate, Foothill’s highly sought after seasonal. I arrived at The Casual Pint where they were having an infusion night with a new brand in town, Blue Pants Brewery. They were still struggling with getting the Dogfish Head style infuser working. After tinkering with it and bumping up the gas pressure significantly, I was able to get it flowing. 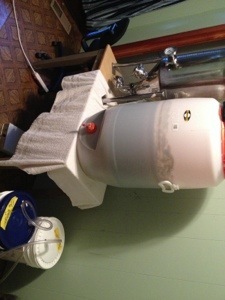 The beer being infused was the Spare Pair Pale Ale with Simcoe hops. I sat and talked with Blue Pants TN sales rep, Kimmie. She told me about the brewery and their line up. I look forward to trying more beers from them. I left The Casual Pint and headed over to Suttree’s. It was the Monday night, and Sut’s has started to do a bluegrass jam every Monday. This was also bartender Stanton’s birthday party, and there was a free keg of Dark Horse Brewing Company’s Thirsty Trout Porter. I had a drink and said happy birthday to Stanton, and hung out a little bit before calling it a night. 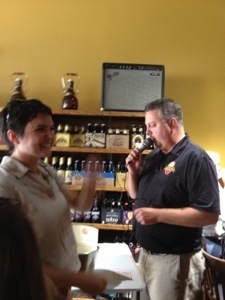 Blue Pat’s Brewery rep, Kimmie. Tuesday there was a few things going on, but a friend of mine so graciously traded me a ticket to Dave Chappelle’s show at the Tennessee Theater. I just had a quick drink at Suttree’s before heading over to the show. Dave is a comic genius and the funniest person of this generation, but his show was marred by hecklers and other dumbasses who didn’t know how to behave. It was so bad, that many news outlets reported on it the next day. See Knoxville, this is why we can’t have nice things. Heed the signs next time, dumbasses. 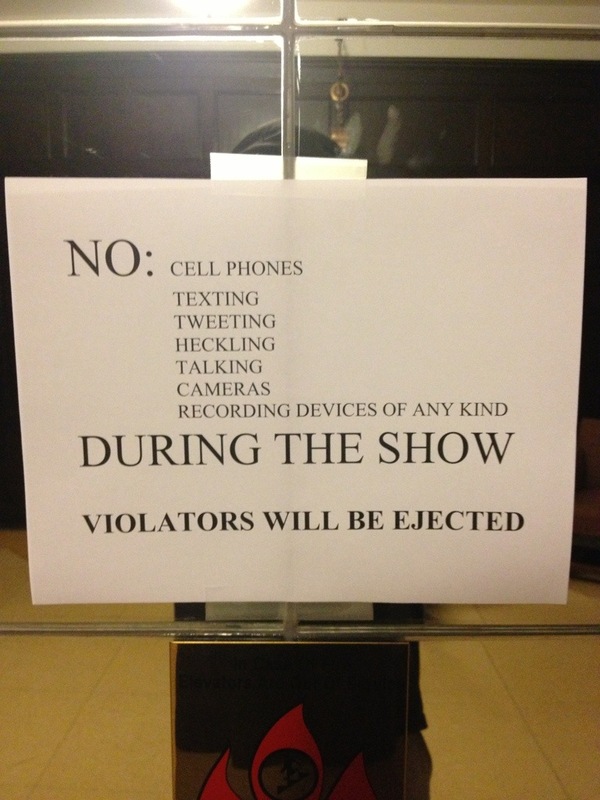 Signs posted all over the TN theater. Too bad they were ignored. Wednesday after work I headed over to The Casual Pint’s Bearden location for Highland Brewery’s bingo night. Highland founder Oscar Wong was there along with my friend and sales rep, Kitty. I sat and sipped on a dry hopped, cask conditioned Gaelic Ale. The place was packed and they ran out of bingo cards. Luckily I got one and played several rounds. It was fun, even though I didn’t win. Thursday after work I went on a bike ride with my son downtown. We road around and stopped in really quick for some ice water at Suttree’s. Next door at Downtown Wine and Spirits, there was a free Victory and Southern Tier tasting. I tried several things while talking with several of my beer scene friends. We didn’t stay long. We rode around some more and ended up joining the patriotic bike parade through downtown. Afterwards I dropped him back off at his house. I left there and headed straight to Sunspot for barrel night. Many of my Brew Mob and Knox Beer Crew friends were there as well. There was more rare and tasty beers on tap upstairs. I tried several that I have been wanting for awhile. Here’s a Brew Mob video from last night. A video of Don from Knox Beer Snobs from last night. Tonight I’ll be infusing New Belgium’s Heavenly Feijoa with fruit at Suttree’s. This starts at 6, and I’m hoping to see you out. If I have time, I might stop by BBM later in the evening to see a few brewery friends. Tomorrow is Knox Brew Fest at The Southern Railway Terminal. I will have a booth and be pouring my Chocolate Covered Strawberry Stout, Apricot Honey Lager, Maibock, Rauchbier and an IPA infused with hops. I will also have merchandise for sale, so bring extra money. I am looking forward to seeing everyone. I will be live picture and video blogging all day at the event, so come by the booth and you might end up on this blog. This is all for now, I hope you are having a great week. This entry was posted on Friday, June 28th, 2013 at 16:29 and is filed under #knoxbeer, beer travel, beercation, Craft Beer, Drinking, home brewing, Knox Beer Crew, Knox Beer Week, Knox Beer Week logo contest, Knox Brew Fest, Knox Brew fest 2013, Knoxville Beer, Knoxville beer bars, Knoxville beer blog, Knoxville Beer week, Ratchet, Tennessee Beer Festival. You can follow any responses to this entry through the RSS 2.0 feed. You can leave a response, or trackback from your own site.